Motherhood is embedded with decades of tradition, with some child-raising facts being passed down for generations. From muslin swaddling cloths to sleeping bags and cot sheets, Aden and Anais’ range of baby goods are based on the family traditions of founder Raegan Moya-Jones. And because she’s a mum herself, Raegan’s products have been developed for your baby, but designed for you! 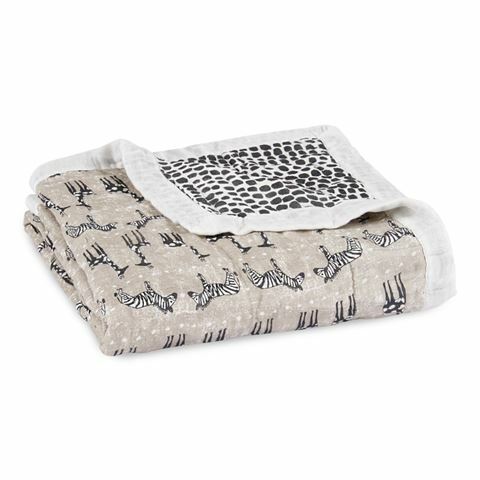 Crafted from four layers of viscose derived from bamboo, this Sahara Motif Silky Soft Dream Blanket stays soft and comfortable wash after wash. With its plush construction, this versatile blanket is perfect for a variety of uses – for sleeping, playtime, cuddles, tummy time and much more! Crafted from viscose made from bamboo. Made from four individual layers. Perfect for a variety of uses – as a blanket, a mat for playtime, a mat for tummy time and much more.